Have you ever watched “Mall Cop” and wished you could ride a Segway? Well now you can! 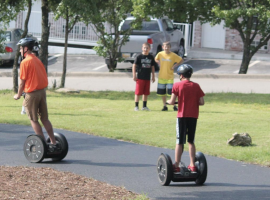 Feel the excitement of riding a Segway at Branson Segway and Adventure Center! Bring your family and friends and enjoy a ride on the free-roaming track. A Segway Personal Transporter is a self-balancing device and its name is derived from the word "segue" which means, "follows." The motorized scooter uses gyroscopes to remain upright and is controlled by the direction in which the rider leans. Riders lean backwards, forwards and to the left and right using a thin handlebar attached to a pole. When you arrive at Branson Segway and Adventure Center, the friendly staff members will help you choose your ride time and helmet. Then, it’s time for a lesson on safety and how to operate your Segway! After a thorough time of instruction, the staff will accompany you out to the track to make sure you feel confident! Then, it’s time for some fun as you ride the Segway on the free-roaming track! Don’t miss out on this unique opportunity to ride a Segway! Click HERE for more information!